Anyone feeling an inordinate amount of pride at a newly acquired HD TV might want to stop reading now to avoid the nauseous sensation that hearing about Japan 's next-generation high-definition TV system is sure to induce. 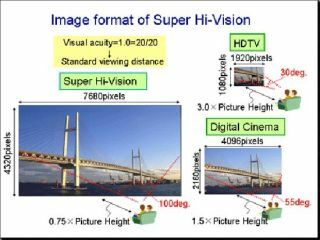 Researchers at NHK (Japan's public broadcaster) recently wheeled out their Super Hi-Vision (SHV) system to astonished journalists in Tokyo. As PC World reports, SHV blows current high definition clean away with a knockout 4,320 horizontal and 7,680 vertical lines. The impressive numbers don't end there - an uncompressed SHV stream weighs a massive 24Gbit/s, which is impossible to broadcast. Accordingly, NHK has used MPEG-4 AVC/H.264 to squeeze the data into a 128Mbit/s stream that's still six times fatter than current HD broadcasts. There's no word on when SHV will become a working broadcast standard. But given NHK's history of innovation (it developed high-definition video in 1969), we shouldn't be surprised if we're all shopping for SHV-compatible TV sets within the next 10 years.